All transactions are safe and secure with a reliable history in online purchasing behind each of our associates. 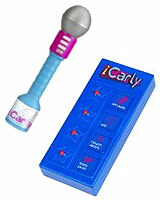 Buy the iCarly Sam's Remote, Carly's Microphone to own iCarly clothing and merchandise. Recapture the energy of the Miranda Cosgrove TV show with an iCarly microphone that plays the theme song, in addition to allowing you to amplify your voice as you sing along to your favorite Miranda Cosgrove songs or hits from the TV show soundtrack. Pair the microphone with Sam's remote for the perfect set. The interactive remote features buttons like applause, boo, random dancing and sound bytes that trigger corresponding effects. In addition to the iCarly Sam's Remote, Carly's Microphone above, browse the iCarly Clothing Gallery for more apparel like men's and women's clothes, kids shirts or hoodies.